Rhubarb was wildly popular in Victorian England after a new variety was introduced at Queen Victoria’s coronation. The variety, later known as Victoria rhubarb, was easier to grow than previous forms. It was cooked into all sorts of sweets, from pies and fools to jams, jellies and custards. Though technically considered a vegetable, rhubarb is most often treated like a fruit in cooking. Rhubarb is usually combined with sweet flavors to counteract its natural tartness, but it can also be paired with savory dishes alongside cheeses and meat. Rhubarb is coming into season now in California and I’m starting to see those familiar pinkish-green stalks at the market. I enjoy playing with rhubarb in various dessert and drink preparations. This rhubarb simple syrup is great when mixed into cocktails, but it can also lend a unique flavor to sparkling water or juice. When reduced to a thicker syrup (directions are given below) it can be served over pancakes, waffles or even on top of oatmeal as a seasonal spring alternative to maple syrup. When shopping for rhubarb, look for stalks that are crisp, bright pink, thin, and clean looking (no damage from insects or disease). The thinner and darker pink the rhubarb is, the sweeter it will be. 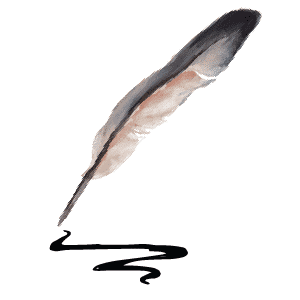 Avoid stalks that seem too old or slimy. Lighter colored stalks tend to be more tart, which is fine in this recipe since it calls for a good amount of sugar. Remove the ends and chop the rhubarb into small pieces. 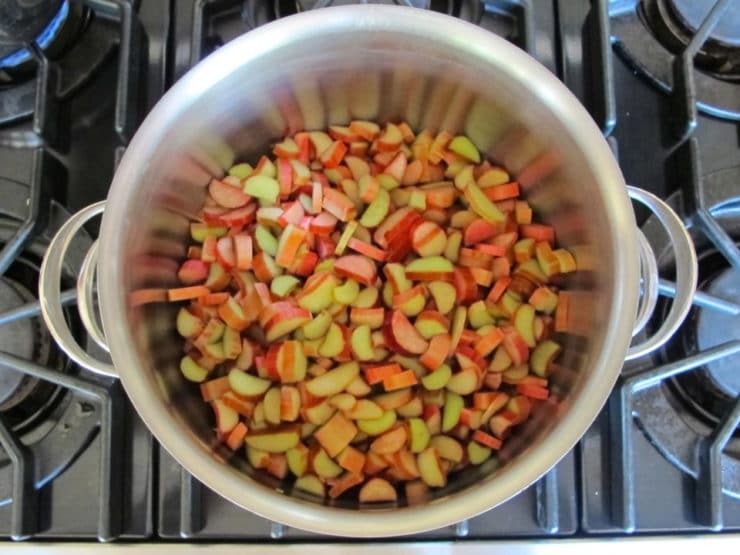 Place the chopped rhubarb in a medium saucepan. Cover with water and bring to a boil. 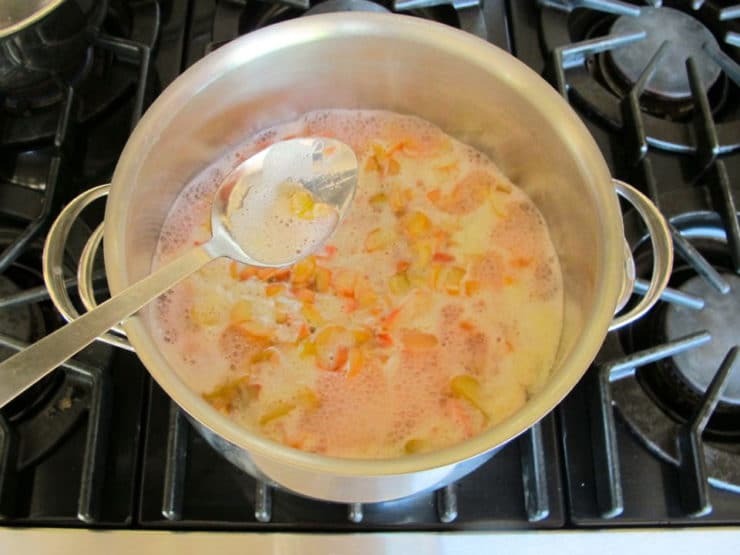 Reduce to a medium simmer and let the rhubarb cook for about 20 minutes. Skim any foam that rises to the top. After about 20 minutes, the rhubarb will become mushy and will have lost most of its color. The water will be a bright pink/red. Remove from heat. 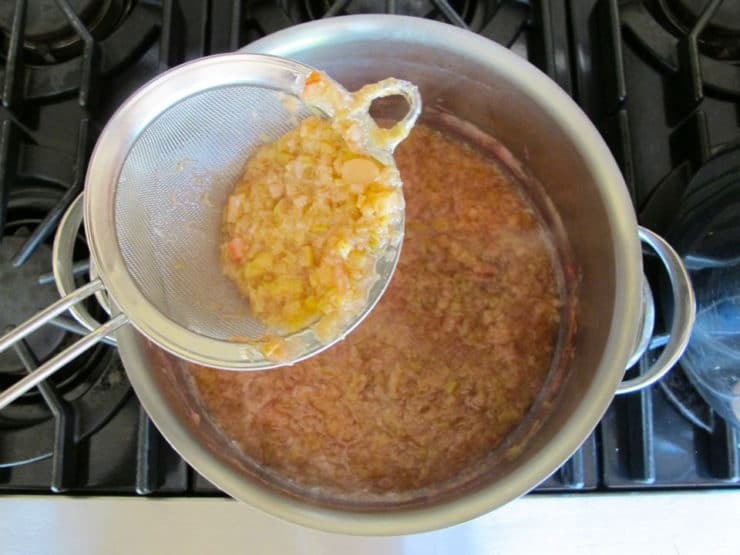 Strain the rhubarb liquid through a fine mesh strainer into another clean pot, separating the rhubarb from the liquid. Because the rhubarb breaks down more than raspberries or strawberries, the resulting liquid will be slightly more opaque. Once the rhubarb liquid has been strained, discard the rhubarb. 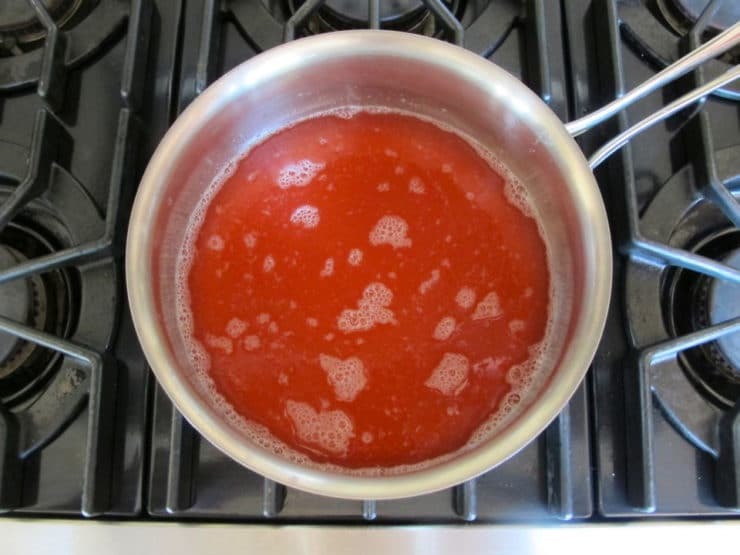 Add 1 ¾ cups of sugar to the rhubarb liquid. Bring back to a boil, stirring frequently to dissolve the sugar into the syrup. Let the syrup simmer for 5 minutes till the sugar is completely dissolved, skimming any additional foam that rises to the top. Remove from the heat and allow to cool completely. Pour into a glass container, seal and refrigerate. The syrup should last for several weeks. Note: If you prefer a thicker syrup for use on pancakes or waffles, you can simmer it for several minutes longer till the liquid reduces and thickens more. The consistency as written is perfect for mixing into beverages. I made a really yummy drink with 1 part Coldstream Clear, homemade apple pie flavored vodka and 2 parts rhubarb syrup. I’m in love with this new drink! And the color of the syrup is just Gorgeous! Thanks for the recipe!!! Just boiled up a batch and I can’t wait to shake it up with some Grey Goose vodka and a splash of fresh lemon juice to make my Saturday night Martini! Hope this lasts me all summer. Just wondering if you tried canning and if you have how? I juiced rhubarb in a double boiler and extracted the juice- I didn’t add any sugar or water. I want to make syrup from the juice- how should I do that? Add sugar to the juice. Simmer juice and syrup for 5 minutes till the sugar is completely dissolved, skimming any additional foam that rises to the top. The rest of the recipe would stay the same. Hi Carol, Tori’s assistant Ashley here. I would add water and sugar to the juice and put it back on the stovetop. Heat for 5 minutes or until the sugar is completely dissolved. So how much of the double boiler juice to water and sugar should I use? I made this syrup. It is very foamy…when i pour it it foams like soap, is this normal? I used green and red rhubarb. And i just added the sugar to the rhubarb and water to save time…it tastes good but im concerned abt the foam. Hi, Tori’s assistant Ashley here. There will be some foam when making this syrup, but it should be skimmed off of the top as it cooks down. 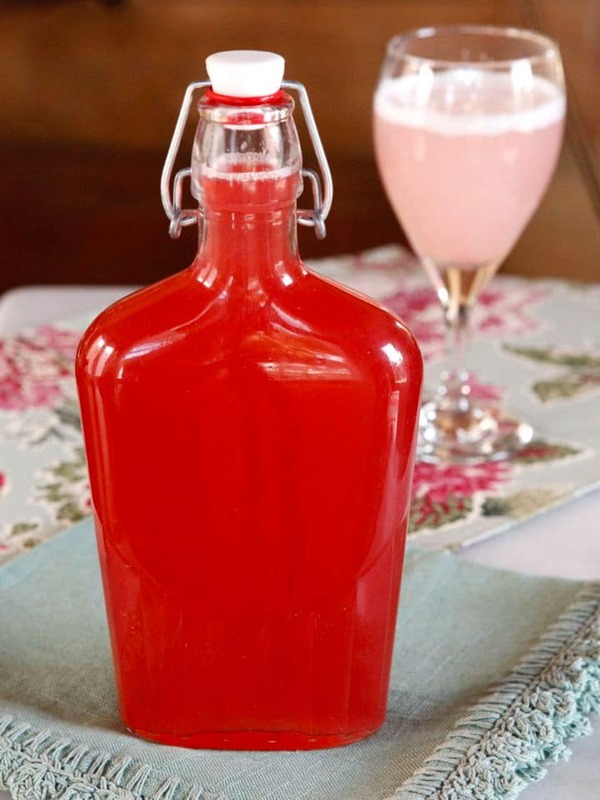 i used it to make AMAZING rhubarb margaritas! And the color … gorgeous too! I found 2lb of rhubarb worked with half the amount of water specified here (2 cups instead of 4) and 2/3 of the sugar. This is the second time I have made it now. It tastes amazing! We mix it with Soda water with a twist of lemon on ice. Very popular amongst our friends and family. Thank for sharing this wonderful recipe! I agree that the twist of lemon makes the difference. I think it offsets the sweet a bit. If I want to make a lemonade, how much water should I add to how much syrup? Hi, Tori’s assistant Ashley here! 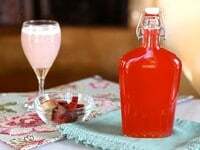 I would start with your lemonade and slowly add the rhubarb syrup in small amounts until you reach your desired flavor and sweetness. Instead of discarding the rhubarb, why not use it when making currant, gooseberry or other berry jellies and jams that need more fiber than the berries can provide? Another use could be to combine it and use it for fruit leather. In version 1.0, I added less lime juice and 1.5 oz. of lemonade. Also very good and a little sweeter. A splash of sparkling water might also be good. Equal parts tequila, lime juice and rhubarb syrup. Shake with ice or use a Margaritaville Frozen Concotion Maker. It’s in the pot!!! Can’t wait to make some gin cocktails! Thank you for the recipe! I just made this tonight to give as a Christmas gift and it is amazing!!! What a great way to use up the rest of my frozen rhubarb. I was a bit worried during the initial cooking down phase as it was quite pulpy, but it was amazing how easily it strained out to a lovely clear jewel-tone red. I did simmer it a bit longer for a thicker syrup. It’s simple and perfect. Thank you for this great recipe, which I foresee becoming a tradition around here. I just tried this and it is so good my mom had me put some of the rhubarb chunks back into it and it made it even better. It is lovely in a gin & tonic! Or iced tea. I am certainly going to make this! I have 15 lb of rhubarb and have already frozen lots. I think I will make this, refrigerate some and freeze the rest in canning jars! 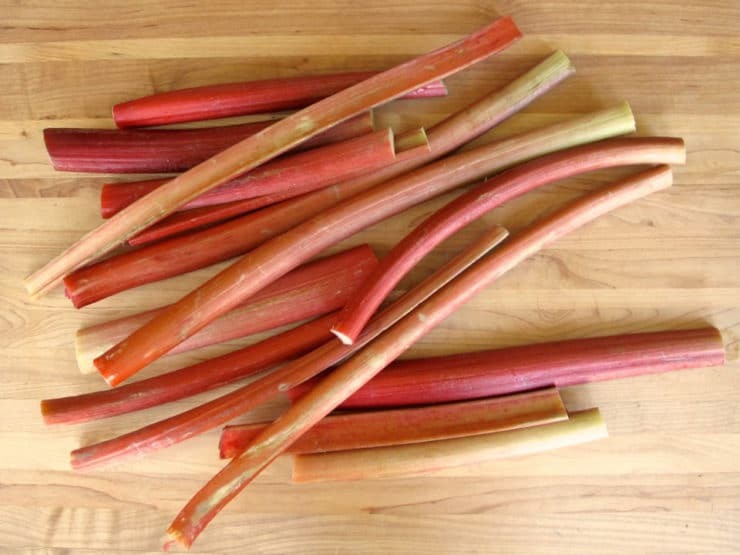 Instead of discarding the cooked rhubarb, it can be mixed with honey and lemon for a delicious spread (jam, preserves). 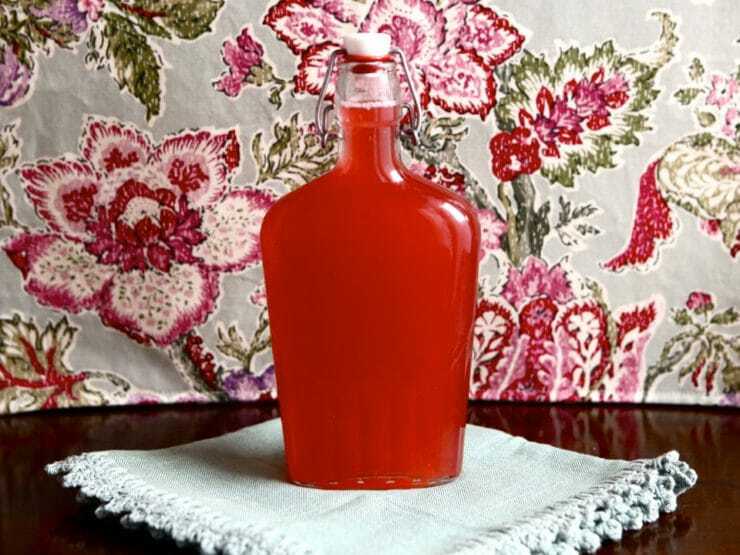 How long will the Rhubarb syrup keep? Hi Ish, sugar acts as a natural preservative here. If you’re refrigerating it should keep for at least a couple of weeks; I’ve kept it for up to a month refrigerated without issues. Discard if you notice any mold growing or an off smell/taste (always err on the side of caution here, foodborne illness is no joke!). Another use: I’ve been cutting up a stalk of rhubarb and including with my apples when making applesauce. Delicious. I love rhubarb and this year’s crop in abundant in Arizona. I try to stay away from sugar. Have you tried this with stevia (I grow my own) or agave nectar? Or perhaps honey or coconut sugar? I have not Penny, and I would worry that the syrup might not thicken the same way it would with sugar. Stevia is great, but it won’t thicken the same way a sugar-based syrup will (which may or may not be a problem– a thinner syrup will mix well with drinks, but won’t be great on pancakes, etc.). Honey and heavier syrups like agave tend to separate from the water when chilled, resulting in an uneven syrup. Coconut sugar might be a possibility, I have never tried it… it’s worth a shot! I live in Vegas. Can I grow it here? I get some shipped to me from Alaska. wow.. this is lovely.. you so rarely get to experience rhubarb without an accompaniment in cooking.. and the color is just enchanting! I have a few bags of rhubarb that I froze from last season. Any chance I can use it to make this syrup? Looks wonderful, thanks. Hi Miriam, I think you probably could. I haven’t made this with frozen okra before, but I can’t imagine why it wouldn’t work. O if I could marry some one like you!!!! Why not save the cooked rhubarb—cook with some sugar, and devour?! I made bread with the pulp! came out wonderful! Danielle, would you be willing to share the bread recipe? I’d like to be able use up some of my rhubarb pulp. I’ve never heard of rhubarb syrup! Most excellent! and I have rhubarb ready to pick! I love rhubarb this is a great idea. Thank you!